The WolfPack 16x16 Component + Audio Matrix Switch Over CAT5 is a high performance and professional video and audio signal switching matrix for devices that has component video outputs like a cable box, satellite box, DVD player, etc. and TV that have component video outputs. Mainly used in sports bars, restaurants, radio and television areas, multimedia conference rooms using large screen displays. Our WolfPack 16x16 Component + Audio Matrix Switch uses a high performance processing and buffer chip assuring the output is more stable, that the images are clear with no shadows. It also includes and embedded intelligent control and management software via its RS232 control interface. With PRO Ultra-wideband with gain compensation and synchronous signal correction technology, switch faster, no flicker-free. Why not buy this 16x16 Component + Audio Matrix Switch Over CAT5 today? Why not buy this 16x16 Component + Audio Matrix Switch Over CAT5 Switch today? Why not buy this 16x16 Component + Audio Matrix Switch today? HDTV Supply includes a 1 Year Limited Warranty on this 16x16 Component + Audio Matrix Switch. The warranty states that (a) the 16x16 Component + Audio Matrix Switch will perform substantially in accordance with the accompanying written materials for a period of 1 year from the date of receipt and (b) that the 16x16 Component + Audio Matrix Switch will be free from defects in materials & workmanship under normal use & service for a period of 1 years. 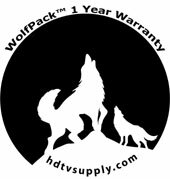 In order to get a warranty replacement for a defective 16x16 Component + Audio Matrix Switch HDTV Supplys Support Team will verify the product is eligible for warranty. An RMA number will then be issued. Shipped replacements will be in like new conditions, tested and all components included. HDTV Supply also sells a 3 and 5 Year warranty for this 16x16 Component + Audio Matrix Switch. Please go to 3 and 5 Year Extended Warranty.